This is a celebration cake for my VegNews Top Blog honour, and a thank you to myself for the hours spent baking for the street fair (nothing like thanking yourself for baking by doing more baking!). Back in the day I used to make a cake sort of like this with a whipped cream filling. I have never tried my hand at vegan whipped cream (I think I saw a recipe once with a coconut milk base), but I tagged this Chocolate Mousse recipe from Have Cake, Will Travel a while back thinking it would be perfect for this kind of cake. Now, while I am comfortable baking bread I am not well versed in the ways of the cake. I searched around for vegan sponge cake recipes and made various modifications as I saw fit (I still think it is too high in baking powder). Not the greatest cake in the world but it did the trick and its mediocrity is masked by all the wonderful mousse filling. I really should email Isa for cake advice. Preheat oven to 325 degrees. Line a 15.25" X 10.25" baking sheet (with sides) with aluminum foil. Grease and flour the foil. 1. Sift flour, cocoa, baking powder, and baking soda into a large bowl. 2. Put apple cider vinegar in a measuring cup. Fill with soy milk to one cup line and stir to mix. Set aside to thicken. In a medium bowl, whisk sugar, oil, flax seed, water, and soy milk mixture until well blended. 3. Add wet ingredients to dry and mix until blended. Pour batter into prepared pan and bake for 15-18 mins, until cake is dry, has pulled away from the sides of the pan a bit, and springs back in the center from your touch. 4. Let cake cool on a wire rack for 3 mins. While cooling, "flour" a linen towel with the icing sugar and cocoa. 5. Put the cake (still in its baking sheet) on the counter. Place the prepared towel on top with the "floured" side in contact with the cake. Make sure the cake in centred with the towel. Put a large cutting board on top and flip the whole thing upside down. The pan will now be on top. Remove pan and foil. 6. 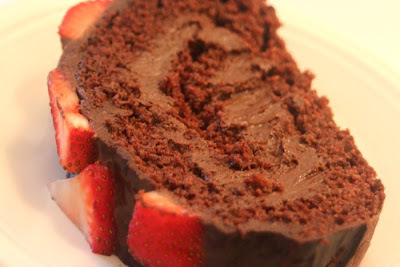 Fold the cake up like a jelly roll in the towel along the short end. Let cool, seam side down on a wire rack. - Make the mousse filling posted here. I used silken tofu instead of the beans (which, apparently, makes me a wuss) because I had an open container after making the lemon currant rolls yesterday. I only used a 3/4 cup to make a slightly thicker mousse. I also added all the melted chocolate at once since it was for a filling and not a stand-alone dish. 1. Heat soy milk to bubbling in a small pot. Remove from heat and stir in chocolate chips until smooth. Set aside to cool for a few mins. 1. Once the cake is cool, gently unroll it. Try not to fly off the handle if the cake breaks up a bit. Even when I made this with eggs it always broke up a bit. Be gentle and understanding, and remember that icing covers a multitude of cake-making sins. 2. Gently spread mousse filling over the cake and re-roll, using the towel to help you bring up the whole side at one time. Once rolled, transfer cake to a large platter or serving dish. You can trim the ends off with a serrated knife if you want the edges to look clean. 3. Spoon icing over top and use a knife or spatula to spread and smooth the icing over all of the cake. The icing will cover up any cracks that may have occurred. Use a clean wet cloth to clean up any icing that may have sullied your serving platter. Place cake in the fridge for 5 mins to let the icing set a bit, then remove and top with sliced strawberries before it sets too much. Place back in fridge and refrigerate for a few hours. 4. To serve: cut cake with a serrated knife, using a gentle sawing motion. Store cake in the fridge, covered.